The most famous application, Evernote complete and helpful to take notes and have all your notes organized is now in the Microsoft Windows store. 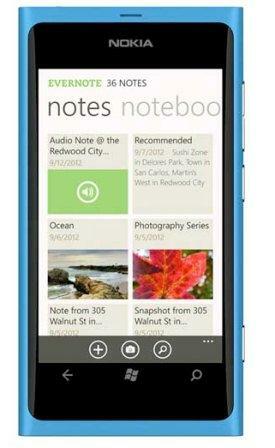 Evernote has released both Windows 8 version, for computers, as Windows Phone for smartphones. On both platforms the Business notebooks or businesses are particularly important. In addition, other functions are equated to catch up with what is seen in Android and iOS. Evernote is one of the most famous apps in the world of portable devices to organize all kinds of notes, papers, recordings, videos or images through a phone, a tablet or a computer. This can label to find more quickly and conveniently, and storing it in the cloud or Internet. On Windows Phone version, note the emphasis placed on supporting the mentioned books Business. These are documents that you can share with colleagues working to complete a common way that file. You just need to create a note from within the Business section, or move notes and created this book. In this mobile platform has also added a new feature to protect your privacy. This is a numeric PIN or code that must be inserted to see your private notes, a good value if your mobile is used by other people and you want to protect your content. Yes, the negative point is that this feature is only available in the Premium version of Evernote. Last but not least, they have improved tools for text editing. This means you can change the text style to italic or bold line by line and not by sections, as before. In addition, it have included other issues such as bulleted and numbered lists, among other options. All of them are listed in the toolbar located at the bottom of the screen while you write the note just below the keyboard. Regarding the version for Windows computers, Evernote update share some points with Windows Phone. The most notable is support for the mentioned books Business, which now have a better management, to copy, paste and move the documents quickly and easily. They have also added a feature called Web Clipper for Internet Explorer 9. It allows saving web pages quickly to sort and label so comfortable and agile. In short, a fine tuning of this tool that increasingly has more fans. Evernote is an application that can be used by students and workers to manage all their content and, now also, share and edit them together. But the best part is that Evernote can get it for totally free through Windows Store.